Art Below’s ‘Thatcherstic‘ opens at London’s Gallery Different with a private view on Wednesday 17th April, the day of Thatcher’s funeral. The exhibition features 10 artists depictions of ‘The Iron Lady’ and is open to the public for 10 days tying in with the ‘No.10’ theme. Similar to Thatcher’s government, there is only one ‘lady’ in the artist line up who include Peter Kennard, Nasser Azam, Gordon Beswick & Harry Pye, Carne Griffiths, Matt Small, Eleanor Lindsay Fynn and Oliver Malin. 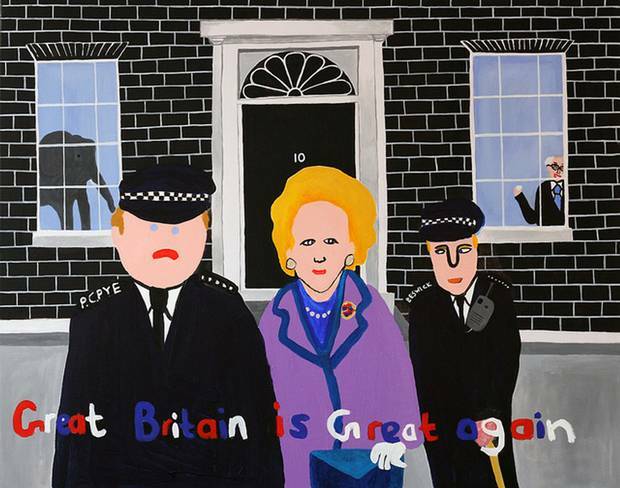 Selected works from the exhibition are due to feature at Westminster tube station from the 22nd April including a large pixellated close-up of Margaret Thatcher’s tearful eye whilst leaving Downing Street for the last time by Saatchi New Sensations Winner Jonny Briggs. “All the artists in the show have one thing in common, we all grew up as Thatcher’s children” remarks Ben Moore, Director of Art Below. “Some of the artists like Peter Kennard whose depiction of Thatcher is in the Tate Collection already have work at hand, however some artists are creating work specially for the show like Carne Griffiths and Matt Small.